SALT LAKE CITY (AP) — Everything fell into place for the Utah Jazz early on defense. It equaled a tough 40 minutes for the Sacramento Kings. The Jazz led wire-to-wire in a 119-98 victory Friday night. Sacramento fell into a double-digit hole after shooting just 30 percent from the field in the first quarter. The Kings never recovered from the sluggish start. 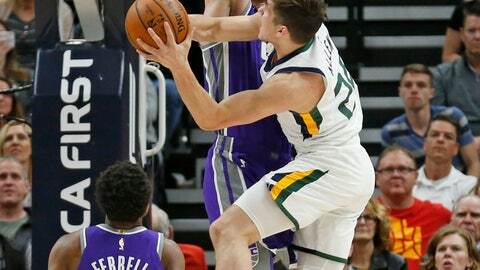 Donovan Mitchell and Grayson Allen each scored 23 points to lead the Jazz to their seventh straight victory. Allen had his first career 20-point game while shooting 10 of 14 from the field. Mitchell dished out nine assists. Rudy Gobert added 17 points, 12 rebounds and four blocked shots, and Joe Ingles also had 17 points in Utah’s 12th victory in 13 games. With the victory, the Jazz eclipsed their regular-season win total from a year ago. Buddy Hield scored 17 points to lead the Kings, Marvin Bagley III added 13 points and 12 rebounds, and Yogi Ferrell also scored 13 as Sacramento lost to Utah for the third time this season. Sacramento opened the first quarter by missing nine straight shots. Hield and Harrison Barnes finally broke the ice with back-to-back baskets. It allowed Utah to race out to a huge lead. Each Jazz starter made a basket to help them score the game’s first 13 points. The Jazz extended the lead to 18-3 on a layup from Mitchell and a pair of free throws from Gobert before Sacramento’s offense finally got on track. The Kings cut the deficit to 20-12 after Bagley banked in a hook shot to cap a 9-2 run. That’s as good as it got for Sacramento. Allen kept the Kings from making up more ground. He scored 19 points before halftime after going 8 of 8 from the field in just 10 minutes. Allen scored Utah’s final three first-quarter baskets and opened the second quarter with back-to-back baskets to help the Jazz take a 39-20 lead. Once Utah regained a double-digit advantage, the Jazz did not ease off the gas pedal again. By game’s end, Allen became only the fourth Jazz rookie to make 10 or more field goals off the bench. Utah led by as many as 30 points before halftime. The Jazz went up 68-38 when Gobert converted a three-point play with 2:09 left in the second quarter. Mitchell tallied zero turnovers to go along with his nine assists after taking over point guard duties for the final three quarters. He was pressed into action after Ricky Rubio suffered a left quad contusion in the first quarter and did not return. Rubio finished with four points and two rebounds in five minutes. It was Mitchell’s fifth game this season where he finished without a turnover. He also accounted for nearly one-third of Utah’s 30 assists by himself. Mitchell said he focused on making simple plays rather than trying to be a point guard. The Jazz weren’t the only ones to lose a key player before halftime. Sacramento had both De’Aaron Fox and Kosta Koufos go down with injuries before the first half ended. Fox played just eight minutes before a sore right foot kept him out the entire second half. Koufos did not play in the second half after straining his left calf. Fox finished with four points and three fouls. Koufos had six points and four rebounds in 12 minutes. Kings: Bagley earned his 18th double-double of the season. … Sacramento outscored Utah 14-10 in second-chance points and had a 12-7 edge in offensive rebounds. Jazz: Allen has averaged 18.5 points per game in April after scoring 127 points in his first 33 NBA games. … Utah scored 25 points off 18 Sacramento turnovers. . Since March 1st, the Jazz lead the league in assists (520). Kings: host Atlanta on Sunday. Jazz: visit the Lakers on Sunday.